Hermes Ship Management opening seaman job recruitment crew for bulk carrier and container vessel rank position Master, Chief Engineer, Chief Officer, 2nd Engineer, Electrician, Fitter, Chief Cook, Able Seaman, Oiler. 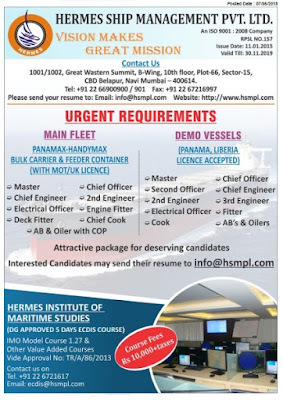 1001/1002, Great Western Summit, B-Wing, 10th Floor, Plot-66, Sector-15, Cbd Belapur, Navi Mumbai - 400614. 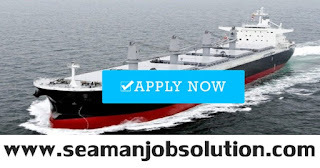 0 Response to "Urgent Recruitment Bulk Carrier, Container Vessel Crew"